We Power Industry Co Ltd is the Sales Dept of William Specialty group. 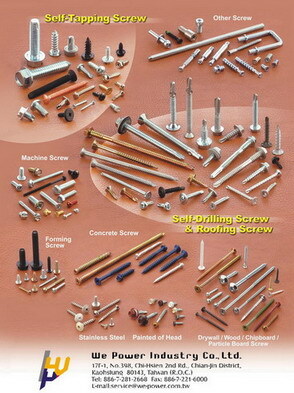 William Specialty founded in 1998, an ISO9001 certified manufacturer of fasteners in Taiwan. In 2006 William re-formed our organization and set up a new company - We Power which focuses on overseas markets and operates from 1/Dec/2006. Manufacturer of a wide variety of fasteners, including self-drilling screws, tapping screws, thread forming screws, thread cutting screws, concrete screw, machine screws, sems, and Custom designed fasteners. And other bolts, nuts, rivets, studs, washers, Neoprene or EPDM bonded sealing washers, and metal stampings. Material available in all grades of steel, stainless steel, Alloy & brass. Products are completely traceable & purchased to IFI, ANSI, ASTM, DIN, ISO & other standards. All finishes including zinc plating (clear, yellow, black, & olive drab), black oxide, phosphate, ruspert, darcotized, mechanical galvanized & all others.